Apple cider vinegar is getting more and more common in kitchens around the world. It is a tasty edition to homemade pickles, marinades, and salad dressings. But has is ever occurred to you to keep a jug in your medicine cabinet? Perhaps it should! Though with the size of bottle I buy I’m content to keep mine in the pantry. I’ve put together a list of twelve reasons every home should have a bottle of apple cider vinegar on hand. If you know of others I’d love to try them out and add them to this article. Apple cider vinegar (ACV) is a natural anti-bacterial. When diluted with equal parts of water, ACV ‘kills germs that cause bad breath and the gum disease gingivitis’. Gargling the same solution eliminates excess bacteria in the throat as well, which may help prevent infections such as tonsillitis or strep throat. A gargle of ACV can help ease the inflammation and discomfort of a sore throat. 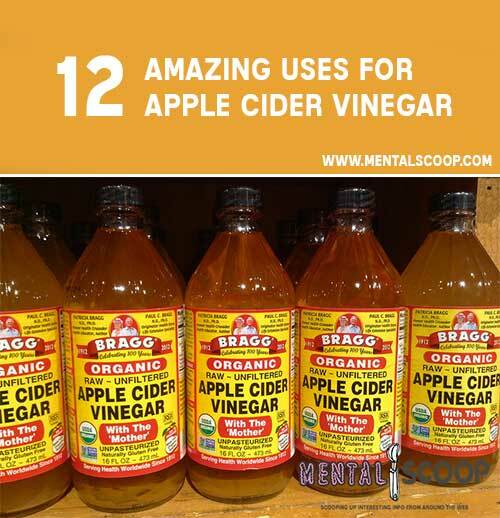 Simply mix 1-2 tablespoons of ACV with warm water and rinse your mouth and throat up to once an hour as needed. As a spoon full of sugar helps the medicine go down, I find you can also swap one tablespoon of ACV for honey in the same mixture and sip slowly for sweet relief. By drinking 1-2 tablespoons of apple cider vinegar in warm water three times a day, you can help regulate your digestion by reducing harmful bacteria in the intestines that can cause digestive problems such as diarrhea. If you suffer from indigestion, try my sweet mixture of one tablespoon each of ACV and warm water about 30 minutes before you eat. This especially helps when you are expecting to eat something a little outside your normal comfort zone. Also, though you wouldn’t think an acidic liquid like ACV would help with something like acid reflux, it actually can ease the symptoms. Just take 1-2 tablespoons of it either alone or mixed with water. Apple Cider vinegar helps maximize the digestion process through its natural acidity. ACV helps break down the food you eat and release more iron into your blood stream than you would normally process. This extra iron draws extra oxygen into your blood as well, helping everything from cell generation to skin health. Apple cider vinegar is a natural cleanser. It can balance oil production of the scalp and help remove environmental contaminants and dead skin. It can also help prevent or eliminate dandruff when used properly. Simply use a rinse of apple cider vinegar in water for a healthier head of hair. I’m always interested to hear home remedies for hiccups. For some it’s drinking water while plugging your nose, while others say you need to scare the daylights out of somebody when they are having hiccups. I’ve never had a great deal of luck with either of those, other than comedic value. However, I have personally tried a spoonful of apple cider vinegar when the spasms started and had success. Feel free to tell me if it works for you as well, but if it doesn’t, at least you didn’t look silly or get scared half to death by a friend. Good news for those of you who need to need to closely watch your blood glucose levels. While this effect is still being studied, I’ve heard two tablespoons of diluted ACV before bed can help to regulate blood sugar as much as 6 percent overnight.